So, this is my first, and only right now, queen ant. I found her a couple of days ago after having walked around a little while during lunch at work. Having gotten back to my desk, I was answering a phone call when I saw this black dot moving around on my shoulder. So while trying to explain a University purchasing system to someone I was also trying to corral this little girl with my free hand. Eventually got her into a Tupperware container to get her home, and just today I finally got her into a test tube setup. I've been wanting to do a setup ever since I started watching AntsCanada videos, Mikey's videos and awesome terrariums really made me remember how much I loved those old green ant farms and filling up my moms empty clear jugs with wild ants. I missed the Prenolepis Imparis fights earlier in the year, but then this girl fell on me and I figure it's fate, so I'm gonna do my best with her. 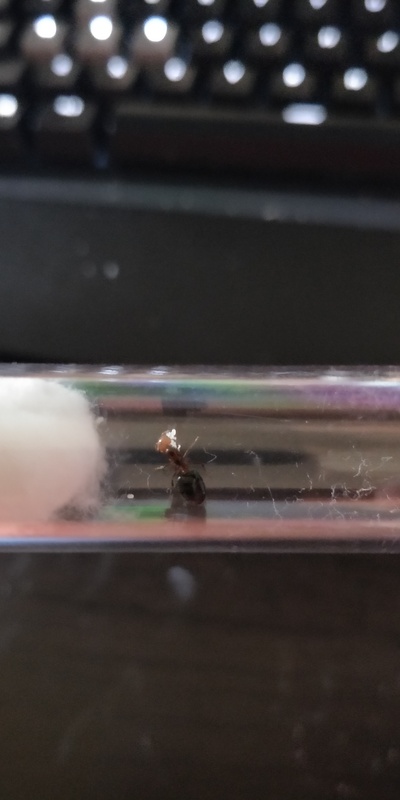 Anyway, I'm pretty sure she's a queen, she has a huge gaster and the hump on the thorax that makes me pretty sure. I was worried she might be a Solenopsis, but Batspiderfish on the identification forum pointed me to Crematogaster, and the point on her gaster makes me fairly certain that Batspiderfish is right. Here's a few photos from when I first found her at work, and was trying desperately to learn how to use Imgur to upload pictures for identification. And here's a couple I took just tonight, after getting her into a test tube for founding. 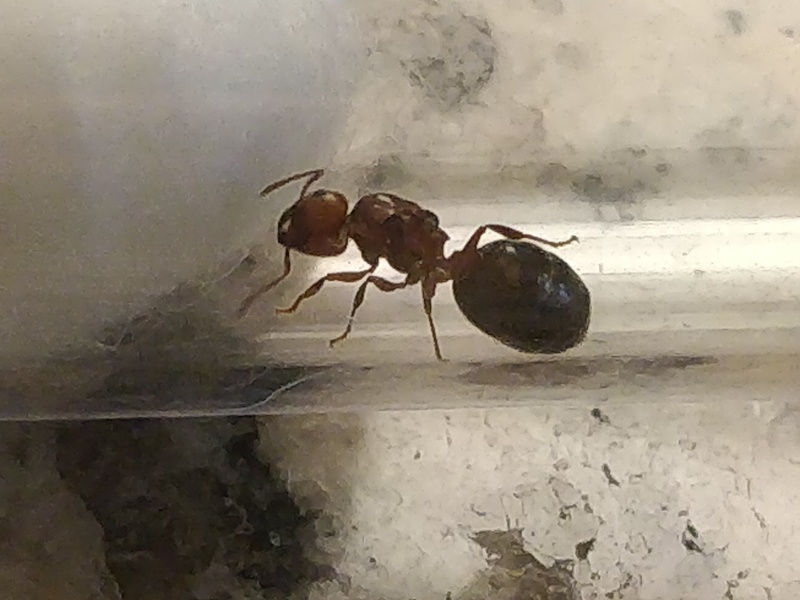 I never expected a queen to be so tiny, but with her hump and gaster, I have a hard time believing that she isn't. She's my only queen, so I've got my fingers crossed that finding her on my shirt when I wasn't even looking means it was destiny. Had a destiny like this as well. I was yesterday going to get a package back when I noticed some random flying insects. 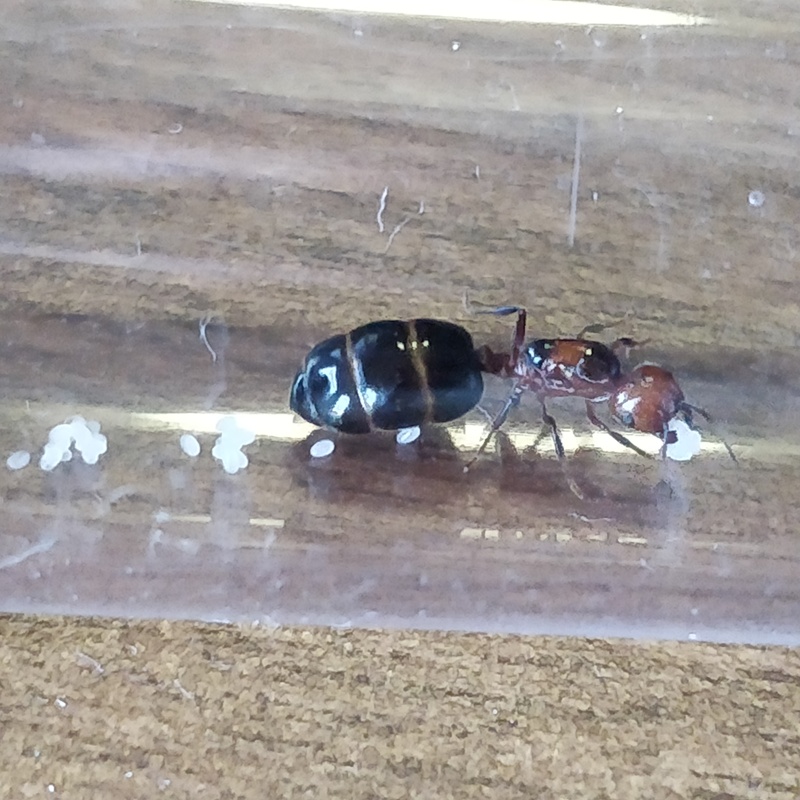 When I went to the screen to type in the codes to release my package (actually on the wrong station XD) I noticed a struggling queen ant and decided to rescue her from the spiderwebs. Luckily for her there was no spider inside. When I caught one of the ants arround there I decided to go and get my other package. Funnily enough on my way there 3 more queens ended up inside my car so I caught them before leaving. When I got home I saw a last one on the handle of my appartments front door. So I took her with me while she was running all over my hands while I was climbing the stairs. So in the end I had 7 queen ants of the type lasius niger. Will go for another lookout at a diffrent location but this time just for any non lasius niger queen. 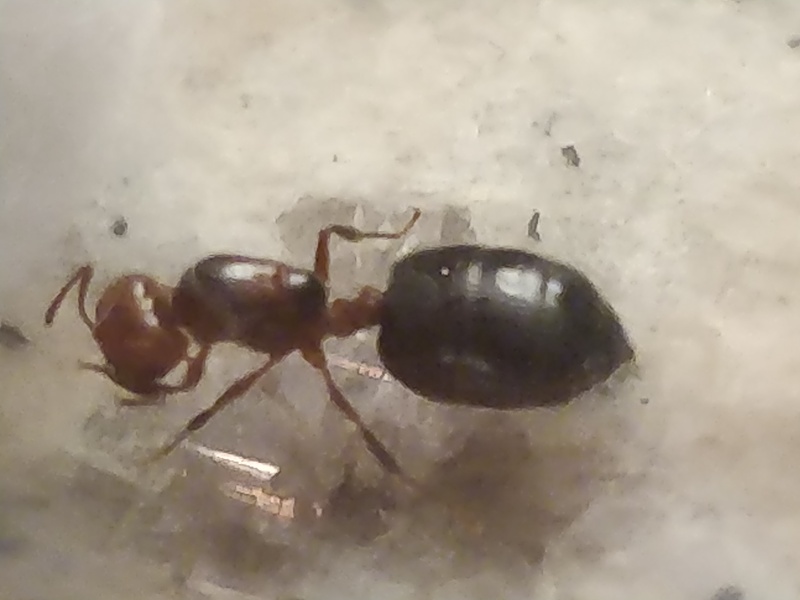 I would love to have at least one diffrent type of ants so I can study them a little bit. 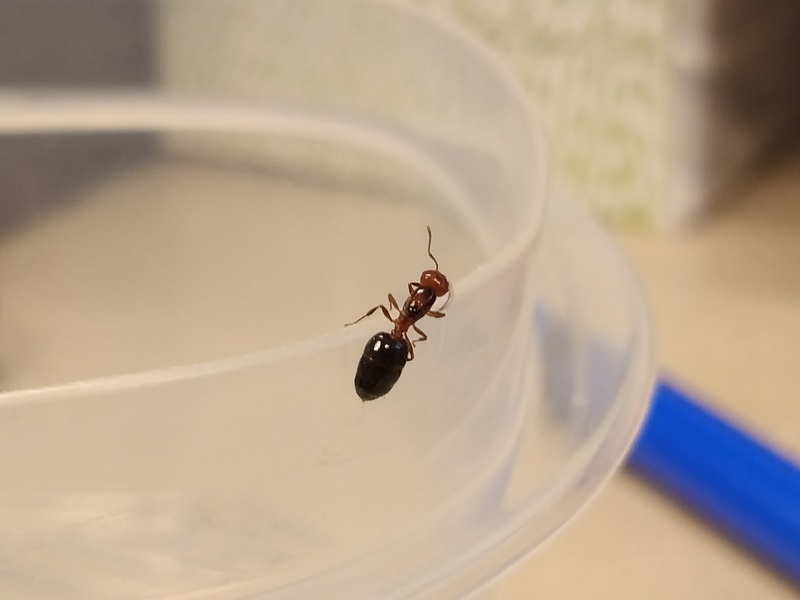 Yeah, Crematogaster for me wasn't even on my radar of ants in Oklahoma, where I am. I had hoped for a Prenolepis Imparis earlier in the year because I heard they do really well indoor in cooler conditions. 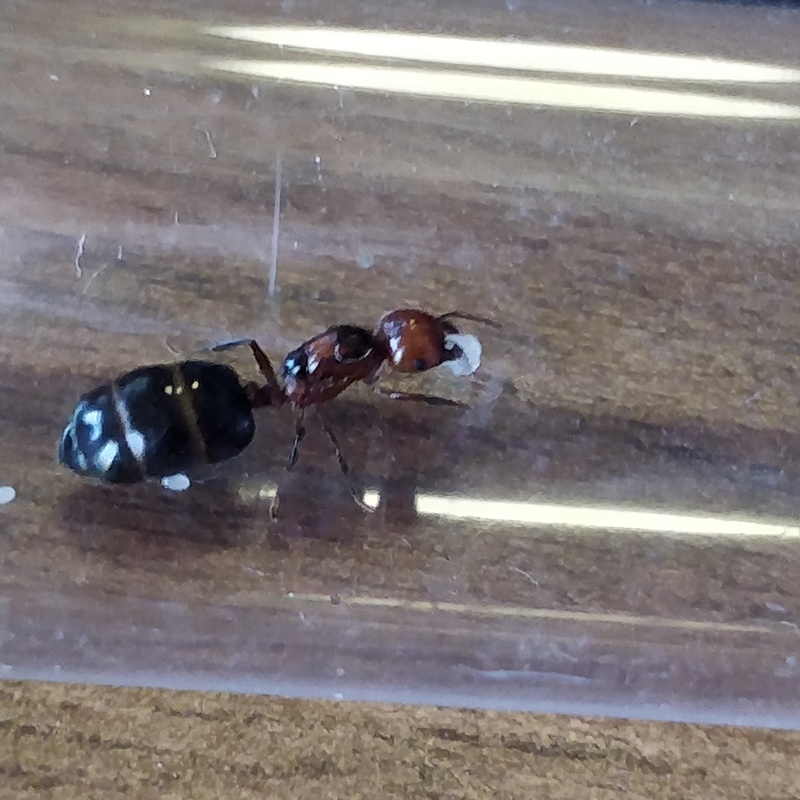 I was also crossing my fingers really hard and hoping for a miracle to find an Ondontomacus trapjaw ant, because I really like the bigger ants. But I'll take what I can get, and I'm hoping my little queen does well. Just a quick post, but she's already got eggs! Two little white dots, right on the dry end of the test tube! I brought her out, since she's only been in the test tube for a day, to show some house guests. I figured she hadn't been in there for too long yet, so showing her off once before leaving her alone for a week or two would be ok, but she's already got eggs! I'm so excited! This time next week is when I'm going to check on her again, I'll post pictures then if things are still going good. 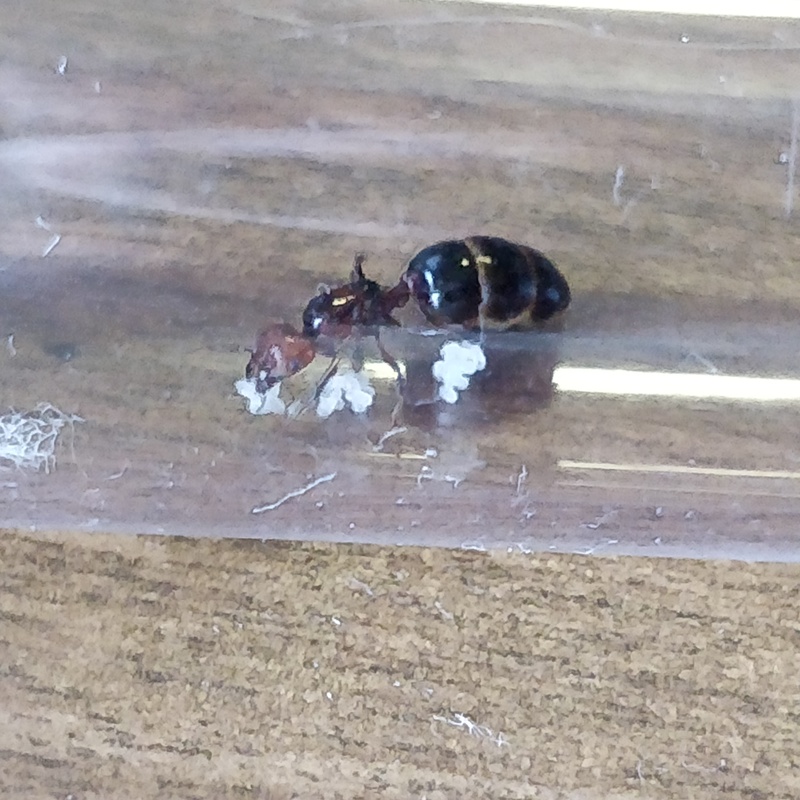 I once caught a crematogaster queen and kept her alive for like all winter. your lucky because i caught mine so late in the season i had to hibernate her before she laid eggs. 1. their eggs take about 2 months to develop into adult ants. 2. the get frighted easily so only check on her once every 2 weeks if not she will eat her eggs. Well guys, I just couldn't wait any longer, so I pulled her out to take a picture. She's got a lovely pile of eggs that she is tending to, looks to be around 10. I snapped a quick picture, and put her back before she could get too stressed, but honestly, I feel like she's been very chill about everything. Laying eggs so quickly, and she doesn't seem to really even react if I pull her test-tube out of it's cubby hole. Also, does anyone know when I should start feeding them again? Honey as soon as the first nanitics eclose? How many workers before I start trying to feed them proteins? Some update photos, as I learn to get some pretty good shots with my phone. I think I may have scared her a bit when I exposed her to light, even though up till now she's been really chill about me checking up way too frequently. This time she seemed to be tending to a ball of brood when I picked her up, so she started moving around, leaving a little trail of brood behind her. 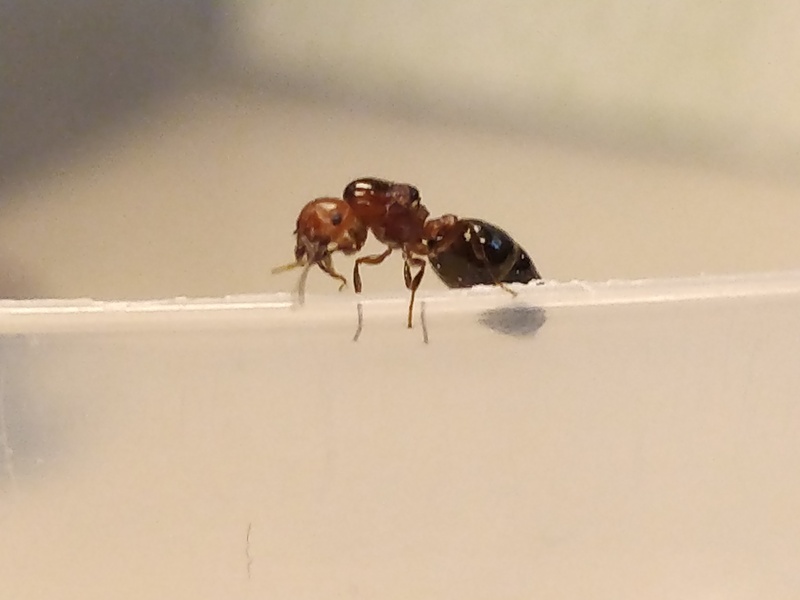 I'm still leaning towards her being Crematogaster, though I'm not sure on the Species. I think she looks real pretty, with that red color and black Prothorax and Propodeum. If anyone has any ideas, let me know. Look at her physogastric gaster. She’ll be laying plenty more eggs soon. Had to look up Physogastric, but yeah. She's been laying a lot more eggs than I kind of expected.